GALT Cover Girl! Sasha, aka Dawn, formerly AC Galaxy Dawn, is CG Magazine’s Spring 2007 Cover Girl! Congratulations to Sasha, her dad Rock Ross, and Carol Sahlfeld, photographer! 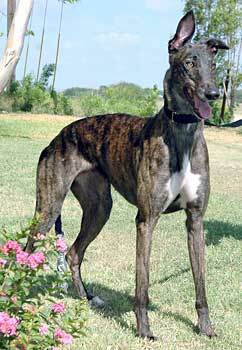 Dawn, aka AC Galaxy Dawn, is a dark brindle lady who was born on June 6, 2001. 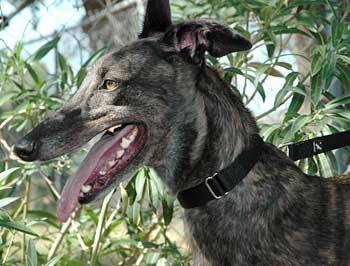 Having just turned 5, Dawn recently retired from racing after competing in Arizona and then in Juarez, Mexico. She had 182 races in her name from the Phoenix and Tucson Greyhound Parks before she and her girlfriend, Betty, crossed the border. With racing now in her past, Dawn decided that Texas could offer her a new start in life and she is eagerly waiting to meet her new family and plan her retirement from the comfort of her very own dog bed. It is not known at this time if Dawn is small animal or cat tolerant. Dawn has certainly decided that living in an air-conditioned home with plenty of food available, a soft bed of her own, Greyhound buddies to pal around with and a person to pet her is definitely preferable to living at the Juarez track. Being the smart girl that she is, it took her no time at all to adjust to living in a home. Dawn shows her appreciation by being very affectionate. She gives lots of kisses and will accept all the attention you can give her, including exposing her belly for a quick rub. Her tail is constantly wagging, which may be how she injured the end of it. Having a bandage on her tail doesn't slow her down a bit. Although still learning about home life, Dawn settles into the back seat of the car readily and quickly, crates easily, has a good appetite, and has mastered the stairs. She is breezing through house training (only one accident so far) and is learning from the three other Greyhounds in the household, whose company she thoroughly enjoys. She's a self-starter with toys and balls and is even learning to retrieve the ball. She's a natural (which is a little unusual for Greyhounds). She will have to learn to share the toys with others since she is not yet used to being showered with so many fun things. Right now she wants them for herself. Her vocabulary has already increased, as she knows her name and understands "out," "no," and "come." Although crated when I leave the house, it is not necessary to crate her at night. She happily sleeps on a dog bed. Dawn is very alert and attentive to the activities outside and loves to bark at the front window. Everything is so new to her, including street sights and sounds. Although GALT was told by the adoption group that transported Dawn to Dallas that she is not cat tolerant, GALT has not yet cat tested her nor has she been around any small dogs. Even after such a short time, you can see that Dawn will make an excellent household pet.